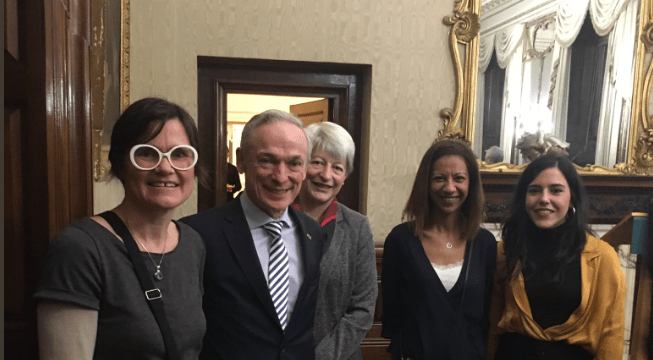 Richard Bruton TD, Minister for Communications, Climate Action & Environment (DCCAE), welcomed the GEO-ENERGY EUROPE consortium to Dublin at a reception in Iveagh House, St Stephen’s Green on the 21 January, 2019. The GEO-ENERGY EUROPE project commenced in 2018 after a successful application to the European Commission’s ‘Programme for the Competitiveness of Enterprises and Small and Medium-sized Enterprises’(COSME). The recent growth of support for public district heating schemes in Irish cities (e.g., Dublin City and South Dublin County Councils funded by DCCAE under Climate Action Fund 2018) provides an opportunity for geothermal heat to form part of the renewable energy mix and help to decarbonise our heat energy sector.